Trichotillomania is a problem to do with ‘Hair Pulling’ otherwise called “Trich”, “Tricho” or “TTM”. Some people define it as being a Body Focused Repetitive Behaviour, or an Impulse Control Disorder, for which Habit Reversal strategies can sometimes be helpful. At different times in life our stress levels go up or come down. This natural ebb and flow is usually manageable. Sometimes life is OK, and sometimes things don’t go so well. When times are hard, one of the biggest contributing factors are stressful life events. In fact, in the 1970s a scale was developed to measure the impact of different experiences on a person’s stress levels, and physical health. Below is a selection of examples from the Holmes and Rahe Stress Scale which lists events which are likely to cause stress in a person’s life. Looking down that list, most people are likely to consider each one of these to be stressful. It is important to remember that some experiences are, by their very nature, likely to cause stress. That’s likely to be the case for anyone, whether or not they have a mental health problem. In such circumstances, a person’s reaction and them finding it difficult to cope, may be entirely understandable and ‘normal’. If you are going through a difficult time, like one of those listed above, then take a moment to consider whether you are actually coping with things as well as the next person might. It might even make you feel better. This is a very simple app that lets you create a list of unhelpful “automatic thoughts” that you might have. You can add an entry to the thought diary, type in the thought, label the cognitive distortion, and then input a rational response. You can then only really edit the entry, delete it, or view a colourful summary in green and yellow. The user interaction with this app is a pretty poor, partly as you have to do more than one thing on the edit screen, and the navigation involves retracing your steps from dead-ends. I find the font size tiny also. There are features that you might miss unless you explore a bit, for example, hidden under the keyboard at the bottom of the thought entry page, there is a ‘list of distortions’ reference page (lifted, it seems, from wikipedia’s cognitive distortion page). 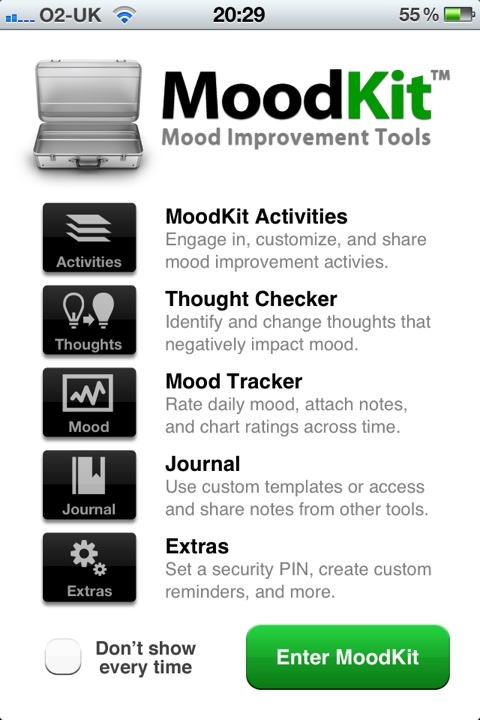 There is also reference made to the app being derived from David Burns’ book “Feeling Good: The New Mood Therapy” . In general, I think this app could be used as a thought record or thought diary, but there are much better apps out there that do the same thing and are easier to use and nicer to interact with. TripleColumn is a free app that can be found here. Working in Private Practice – What’s it like for Psychologists / Clinical Associates? An informal networking day where Psychologists working in Private Practice will share some of their experiences. This will be a good networking and CPD opportunity for any CAAP interested in learning more about private practice or just meeting others for mutual support. In order to register for this event, please complete this online form by Sunday 4th December 2011, so that we can confirm numbers for catering. One of the fundamental techniques of Cognitive Behaviour Therapy (CBT) relates to challenging unhelpful thoughts. This strategy requires the individual to recognise or identify an unhelpful thought, and then to test or evaluate that thought. Often a thought diary or thought record will be introduced for the unhelpful thought to be written down and processed. Most CBT worksheets offer this strategy laid out as a 3 column thought diary to identify the situation, emotions and thoughts, or a 5 column thought diary with the addition of evidence for, evidence against and a more balanced or rational thought column at the end. As I have been looking to review different CBT iPhone apps, I have discovered that almost all of these focus on the challenging unhelpful thoughts strategy and the thought diary in particular. The convenience and privacy of having this functionality on your iPhone makes this a great option, but only if the implementation of CBT and the workflow within the app is well executed. A range of CBT focused worksheets are available on the Moodjuice website. We tried to design resources to most effectively facilitate this particular process of identifying and challenging unhelpful thoughts. On the site you can get a traditional 5 column thought diary (such as you might find in Mind Over Mood (Padesky & Greenberger, 1995) , but you can also access a 3 column thought diary, or identifying challenging thoughts worksheet, which, coupled with a separate thought challenging worksheet gives you enough space to explore and evaluate those unhelpful thoughts. You can even get an audio version of this challenging thoughts worksheet. As you can directly access and print-off multiple copies of these worksheets yourself from the Moodjuice Professional site (and not necessarily rely on the photocopied versions you might otherwise get), I hope you will feel better equipped to effectively challenge those unhelpful thoughts. CBTReferee is an iPhone app that helps the user to record unhelpful thoughts, following a Cognitive Behaviour Therapy (CBT) approach. This tool focuses on the thought diary element of the thought challenging exercise which is a common strategy in CBT interventions. I read some of the CBTReferee website before purchasing this app and I really liked the concept of introducing this strategy with the football analogy of the ‘unbiased referee’ or ‘fair ref’ who evaluates thoughts objectively and does not allow thoughts to ‘cheat’ you into feeling down or anxious. I was disappointed to find that quite a lot of the content of the CBTReferee website, and some elements of the app were carelessly written, for example, the description of Cognitive Behaviour Therapy (CBT) was not exact, there were typos, a blank ‘coming soon’ page, and only a very casual description of the ‘bad thinking’ which is the main focus of this tool. Having said that, their site was smart and the design of the app itself is clean and deliberate. Although it lacks a splash screen at the start, the app itself has a clear menu system which gives you access to all of the functions on one screen. The process of recording and editing an entry in the thought diary is straightforward enough. I like the fact that you can check off more than one type of thought error which applies to your entry. 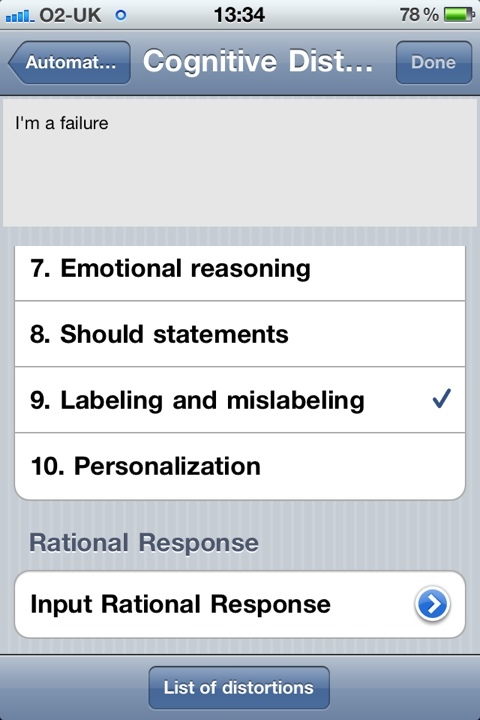 The app’s description of thought errors is arguably incomplete and brief but effective. It also gives a couple of reasonable examples. Some of the thought error labels and the phrase ‘assign forms’ are a bit confusing. 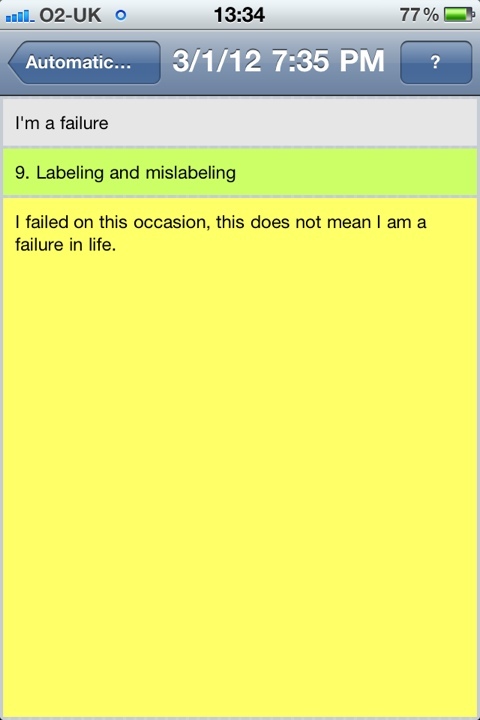 The app leaves the user to their own devices when it comes to completing the ‘referee says’ or balanced thought section. This is a bit disappointing, as without support at this stage users may find it difficult to come up with a more balanced thought. The app does contain two example entries, but in my opinion this app would benefit from more detail in this area. There is a 4-digit passcode that you can set to restrict access to the CBTReferee app on the iPhone – but there is no way of retrieving a forgotten code. 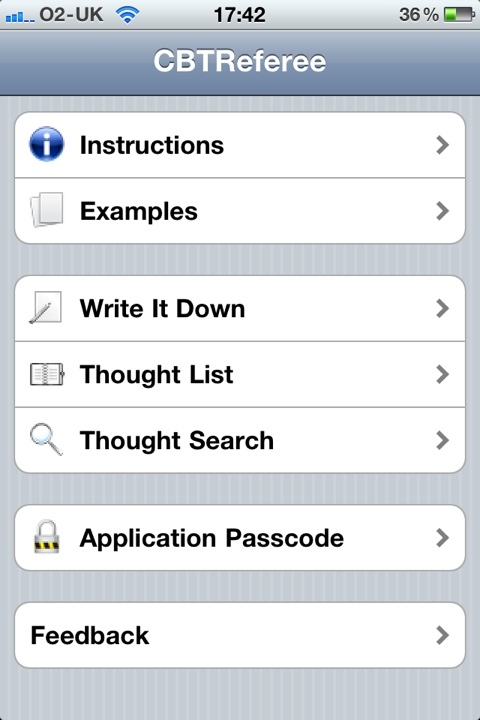 You can search your thought diary by text entry, date, day or type of thought error. You can email a thought diary entry. You can send feedback via email from within the app. The CBTReferee website does not make it clear what consultancy was sought to develop the CBT content of this app. With a bit more attention to detail I think this app could easily be improved, but I would recommend its use to anyone who is already familiar with thought challenging techniques. 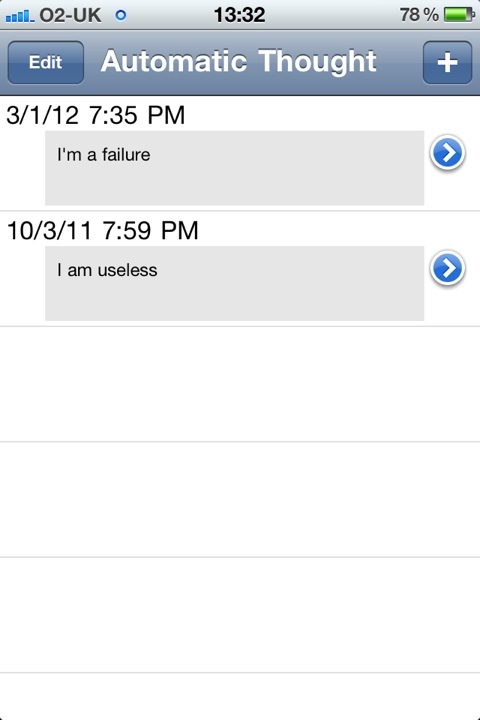 On the whole this is a great implementation of a handy and well designed thought diary app for use on an iPhone.